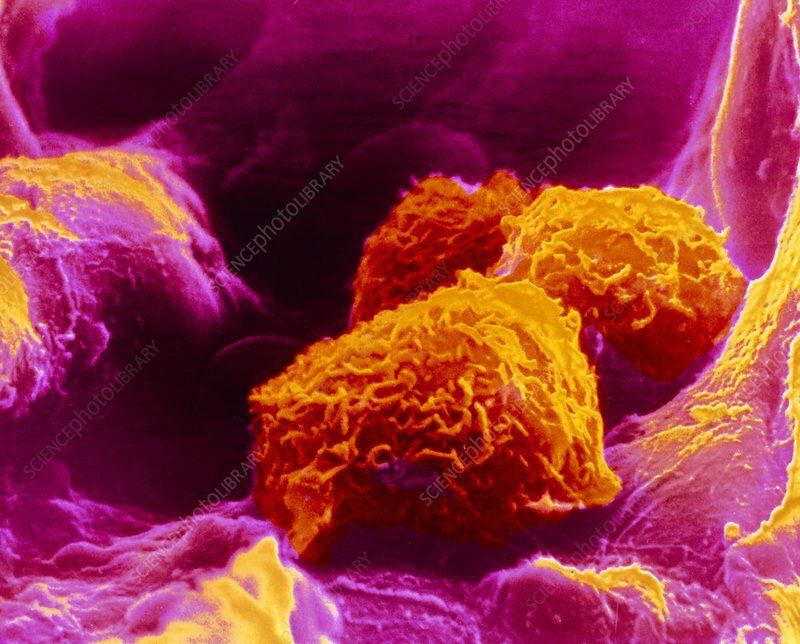 False-colour scanning electron micrograph (SEM) showing three macrophages located in an alveolus (air sac) of a human lung. Macrophages are relatively large, scavenger cells that serve to clear the lungs of dust, pollen, bacteria & some components of tobacco smoke through phagocytosis (engulfing). They are, however, vulnerable to some toxic pollutants & their destruction can give rise to pulmonary diseases. In cases of asbestosis & mesothelioma (a type of lung cancer) the macrophages are impaled & destroyed by needle- like asbsestos particles. Magnification: x2,000 at 6x7cm size, x1,000 at 35mm size.